New Jersey Solidarity--Activists for the Liberation of Palestine is a grassroots organization dedicated to resistance and action in support of the Palestinian struggle for justice, national liberation, human rights and self-determination. We are dedicated to building coalitions, educating the public, spreading awareness, and organizing actions and events that highlight the pressing need for justice and spotlight ways in which we may take part in securing meaningful justice in Palestine. We are committed to standing in solidarity with the liberation struggle of the Palestinian people, supporting Palestinian resistance, and developing a strong and united resistance movement in the United States in solidarity with the liberation of Palestine. As a movement, we are committed to standing firmly against racism and all forms of oppression, and to working in solidarity with liberation struggles of people around the world against imperialism and colonialism. We draw lessons and inspiration from earlier and continuing movements for liberation within the United States and around the world, and from the history of Palestinian resistance. Within the United States, we are committed to acting against all forms and structures of oppression, standing in solidarity with all movements for justice, and securing a foreign policy that rejects imperialism and embraces international human rights and economic and social justice. We are dedicated to exposing and highlighting the role of the United States in furthering injustice and oppression in Palestine, and call for an immediate end to all U.S. aid--political, military and economic--to Israel. We recognize our natural solidarity with all anti-racist struggles and the struggles of indigenous peoples and will work to expand our links of solidarity. We are committed to several primary principles of unity to guide our organizing. We call for an immediate end to the Israeli occupation of all Palestinian territories, the recognition of the full, non-negotiable human right of return for all Palestinian refugees, and full political, social and economic equality under law for all people in historic Palestine. We are opposed to the existence of the apartheid colonial settler state of Israel, as it is based on the racist ideology of Zionism and is an expression of colonialism and imperialism, and we stand for the total liberation of all of historic Palestine. As an anti-racist, anti-imperialist movement, we support equality and justice for all peoples and all religious identities. As a solidarity movement, we are committed to working fully in support of the Palestinian people's resistance movement. We unconditionally support Palestinians' human right to resist occupation and oppression by any means necessary. We are committed to building unity at local, national and international levels in order to provide the international support needed by the Palestinian people in their struggle for liberation, and we invite all that share this commitment to join us in struggle. TAKAFUL Palestinian Family-to-Family Sponsorship Program! Online PLO Information Bulletin archive! Videos available for viewing and download! 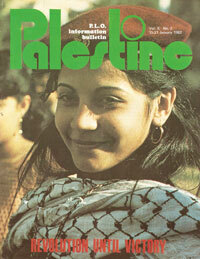 The 1936-1939 Revolt in Palestine and more by Ghassan Kanafani!